Christopher Brennen has spent many great days exploring the marvelous scenic beauty of the southwestern United States. In this book he tells of some of the special places that he has explored beyond the ends of the trails in the American Southwest. 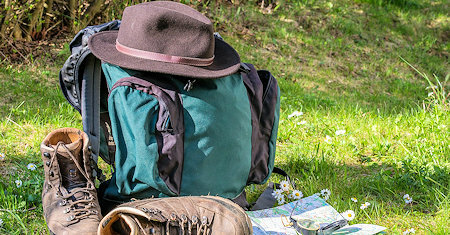 Read about the adventures of a group of older Scouts in Scotland as they traverse The Great Glen Way and explore Arran. I know, its Scouts and they are boring and middle class etc -- but what lies within is the truth about Scout trips. To really camp one should be beyond the reach of motor cars, beyond sight of crowded summer resorts, and far enough from civilization to make one more or less dependent upon the resources of nature and one's own skill and knowledge of woodcraft. Southern California is a spectacular wonderland that the author explored for decades. Later, seeking to explore beyond the established trails, the author and a group of students at the Caltech began a series of adventure hikes. The author describes a series of adventure hikes off the maintained trails in some of the magnificent parks of the American Southwest. The book provides the photographs and maps with prominent features, obstacles, and navigational aids. Each page describes a different adventure hike. The author tried to give as much useful information as possible without spoiling the sense of adventure. For each hike maps are provided, with marked prominent features, obstacles or navigational aids.